Grease an 8 cup pudding mould; sprinkle lightly with sugar; tap out any excess. Drain apricots; set aside 6 or 3 perfect halves for the topping. Cut up enough apricots to make ½ cup to be mixed with the batter later. Save rest of the fruit & syrup for the sauce. Sift together flour, baking powder, salt. Add in cardamom powder & mix the dry ingredients well. In a sufficiently large bowl, cream butter with sugar until light & fluffy & then beat in eggs. Sift in dry ingredients, a third at a time, alternate with milk, stirring until well blended. Stir in lemon extract or lime juice, chopped cherries & ½ cup chopped apricots which you cut up earlier. Pour into prepared mould, cover with lid or foil & steam in a steamer for about 2 hours or until a knitting needle/metal skewer/long bamboo skewer inserted in the centre comes out clean. (Keep water bubbling during cooking, adding more boiling water, if needed). Cool in the mould on a wire rack for about 5 minutes. Loosen around the edge with a knife; invert onto a serving plate. 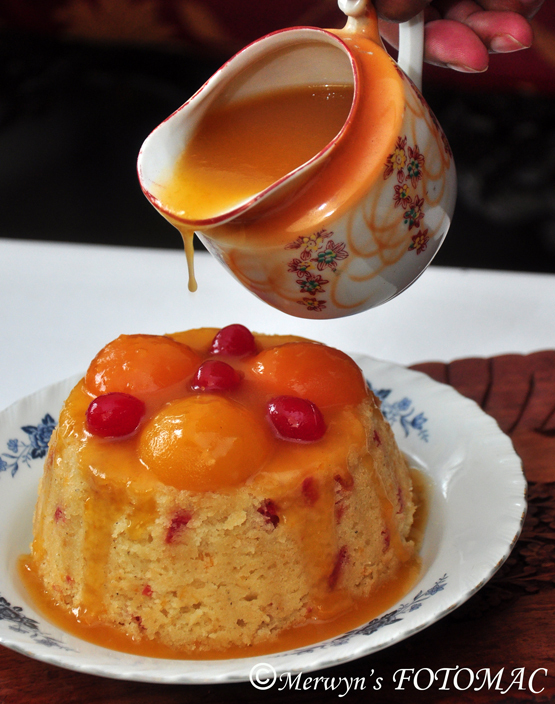 Arrange 6 or 3 saved apricot halves on top; spoon ½ cup hot apricot sauce over the top of the steamed pudding/cake. Cut in wedges to serve with remaining sauce. 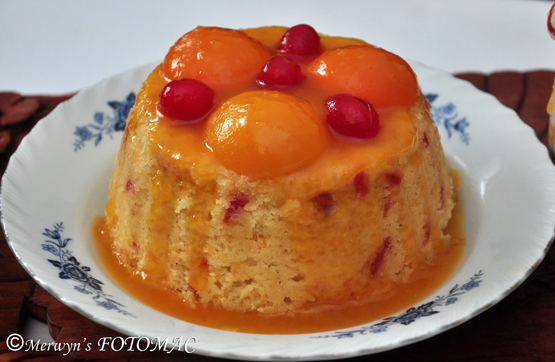 Tip : This is a sweet pudding/cake, so please adjust sugar according to taste. Puree apricot halves along with the syrup until smooth. Pour in a saucepan & stir in honey, butter & salt. Heat to boiling; cook uncovered, stirring 20 mins, or until sufficiently thick & of pouring consistency. 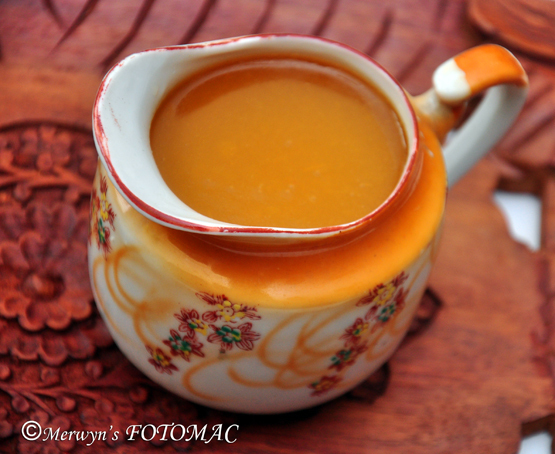 Serve the apricot sauce warm with puddings, pies, ice cream or cake.